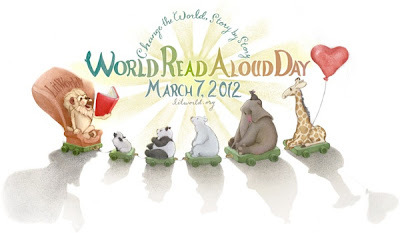 I recently was asked by a wonderful organization called litworld to be one of their brand ambassadors for World Read Aloud Day on March 7th. I was excited and honored. I have been an avid reader my whole life. From when I read my first book by myself to this very day, reading is a therapeutic past time for me- and I love discussing what I read (thus my "mammaslibrary" book review blog). I am asked by other women how I can find time to read!? As busy and stressed as I am, I don't know how I couldn't. Reading is the only way I can wind down before bed, even if it's all of three pages, I have to do it. Reading to me is like a glass of warm milk. But becoming a WRADvocate for litworld.org has forced me to evaluate my influences in reading from when I was very young. My obsession with books was something I took for granted about myself. When I really stopped and thought about it, however, my parents did not read to me when I was little. They had immigrated here from Italy in the mid 1960s, knowing practically no English. By the time they had me, they only spoke self-taught broken English. So reading to me like other American parents did every night was not happening in my home. So as I answered my WRADvocate profile questions, I became baffled. How did I become such a voracious reader and writer if my poor parents were struggling with the language themselves? Well, when you hear it takes a village to raise a child, nothing could be more truthful then when it came to my upbringing. Looking back, I can tell you distinctly the first time I was given a book and had someone read aloud to me. It was my father's American cousin and his wife who arrived at our home with a Little Golden Book of Disney's Robin Hood. They read it to me in bed. I had to be 4 years old. It was wonderful and I was hooked. Though my parents' English improved through the years and bought countless books for my sister and I, they still only read to us rarely. It was the wonderful reading time with teachers and the school librarian that fed my hunger for reading. It was an escape for me as it is for all kids. Even as our class moved into chapter books, I remember my third and fourth grade teachers reading aloud to us. They would always stop at a cliffhanger, leaving us wanting more. It was such a great way to introduce us to the intrigue and rewarding perseverance that chapter books provide. It is something I struggle with at home now with my daughter. She finds long chapter books daunting. I am using the "few chapters a night" aloud approach right now to see if it works. If it wasn't for my father's cousin, my wonderful public school teachers or an extensive local library, I am not sure who would have nurtured my reading skills. I won the school's Young Author's Contest in for both 4th and 5th grade levels! This, from a child whos parents still spoke broken English at home. It is so very important to support programs to help children read. Children come from all kinds of socio-economic backgrounds and reading support may not always come from home, no matter how good a parent's intentions are. It does take a village to keep kids reading and writing. And we need to help make sure those supporting literacy get the resources they need to help children. After all, we may have the next Hemingway out there! Think about the children in your neighborhood, or around the globe. And especially your own children. Read to them often. Take them to the library with a big old tote bag to fill. Create your own family "book club" (see my post on this great idea). Urge your school or parish to run a book drive to support a local used book shop or library. Donate or raise funds as a community service project for organizations such as litworld.org. And for litworld's World Read Aloud Day, plan a cool event at your local library, child's school, scouting troop or just at home with your family! Litworld.org has great downloads, ideas and kits to print and use to make that day reader-ific! Or simply, take ten minutes on March 7th with your kids, grab some books and read aloud. It's the best gift you can give them. I am living proof of that. In honor of my father's cousin, Vito, who with his wife, was the first person to read aloud to me. We lost Vito to colon cancer on New Years 2012. He holds a special place in my heart, always. LitWorld is a 501C3 nonprofit organization led by Executive Director Pam Allyn, a renowned literacy educator and advocate. We work to cultivate literacy leaders worldwide through transformational literacy experiences that build connection, understanding, resilience and strength. LitWorld joins together with teachers, parents, community members, and children to support the development of sustainable literacy practices across the world. Literacy is the foundation for emotional and physical well-being, intellectual growth, and economic security. The right to read and write is a fundamental human right and belongs to all people. Worldwide at least 793 million people remain illiterate. Two-thirds of them are women. All over the world, children are hungry for learning and for the power it brings. Research shows that children learn to read and write best by writing and telling the stories of their own experiences. Yet it is rare to find safe spaces where children feel fully comfortable to do so. Thanks for sharing about this day! Reading is so important in my household.